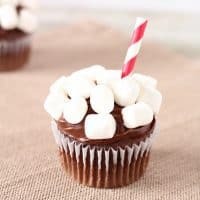 Turn a boxed Devil's Food Cake Mix, store bought icing, and mini marshmallows into fun hot chocolate cupcakes with this easy recipe. It is no secret that I love cupcakes. Cupcakes are a classic dessert, and always a hit with the kids. They are also perfect for serving at parties. No need to slice and serve cupcakes like a traditional cake, since they are made into perfect individual portion sizes. Cupcakes are also great treats for having some fun decorating. We have had fun making snowman cupcakes, Christmas tree cupcakes, and all sorts of other fun cupcakes. 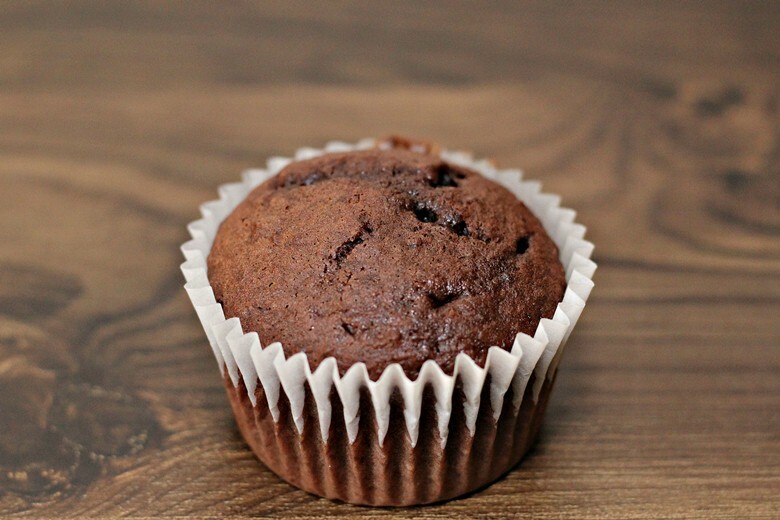 Today I have an easy hot cocoa cupcake recipe to share with you. These delicious devil's food cupcakes are topped with chocolate fudge icing and then decorated to look like little cups of hot cocoa. Made with store bought cake mix and icing, they couldn't be easier to make. Start by gathering your ingredients. You will need devil's food cake mix and any ingredients called for on the box, chocolate fudge icing, and mini marshmallows. You will also need paper cupcake liners and paper straws. 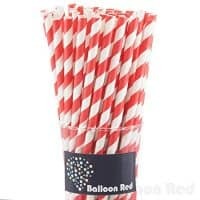 We used white liners and red and white striped straws, but you could use any color that you would like. I would just suggest matching the color of the straw with the color of the cupcake liner to give the cupcakes a cohesive look. Simply bake your devil's food cupcakes according to the instructions on the packaging, being sure to only fill each cupcake tin halfway with batter. You do not want the cupcakes to come out too high. 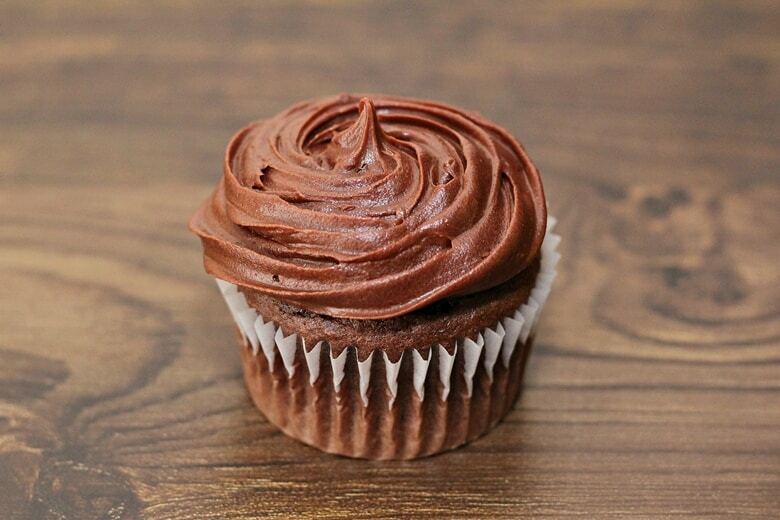 Once your cupcakes have fully cooled, ice them with the fudge frosting. Don't pile the icing on too high — try to keep the top of the cupcake rather flat. 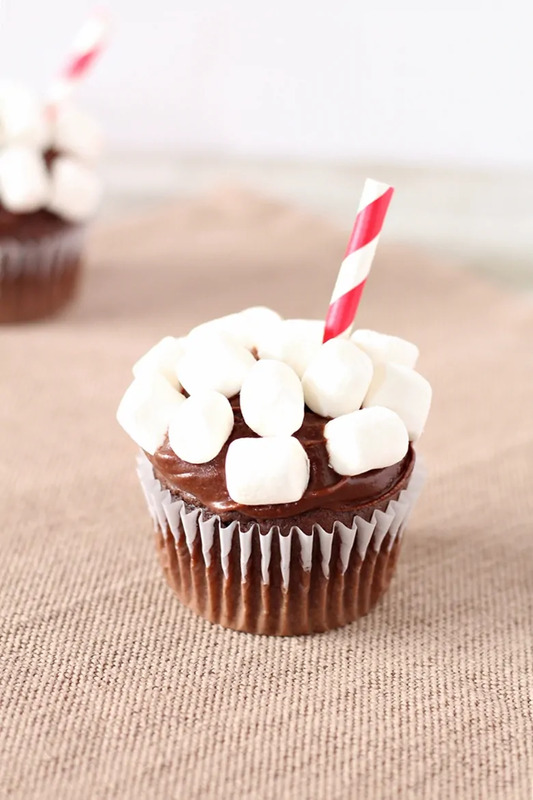 Then, cover the top of the cupcakes with mini marshmallows, pressing them lightly into the icing to make sure they stick on and stay in place. 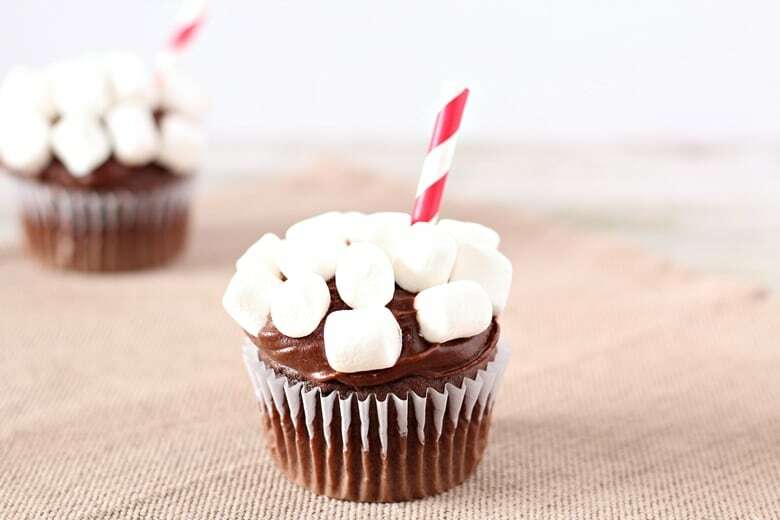 Finally, place a straw into the top of each cupcake at a slight angle to complete the cup of hot cocoa look. 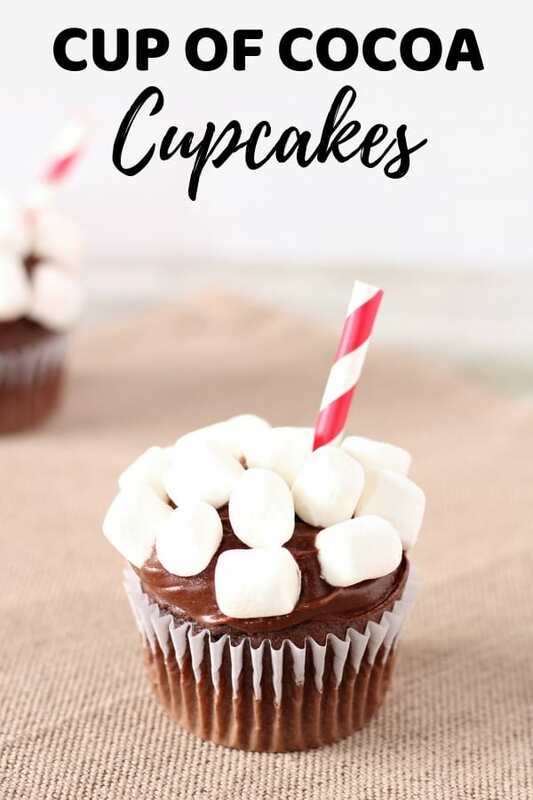 Turn a boxed cake mix into fun hot chocolate cupcakes with this easy recipe. Prepare cake mix as directed on the package. Fill each cupcake liner half way with cake mix and back according to instructions on the cake mix box. Bake according to instructions on packaging. While your cupcakes are baking, cut each straw into 3 equal pieces. Once removed from oven, allow cupcakes to cool fully before icing. Ice cupcakes with chocolate fudge frosting, being sure not to pile it on to high. 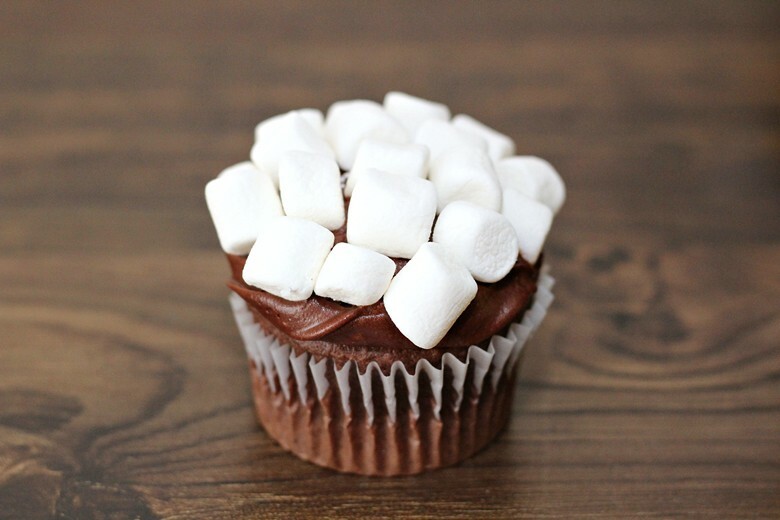 Cover the top of each cupcake with mini marshmallows. Press a straw into each cupcake at a slight angle.